Attacked the bathroom floor today. Grouted the monster. My first attempt at every grouting anything. Didn't go too badly. And nobody got hurt. Garry loaned me his grouting tool and advised me to pour a big lump of grout onto the middle of the tile and then pull a portion into each of the lines between the tile. I tried that and found it to be extremely messy. It also seemed a bit excessive. I tried pouring the grout closer to the edges (tracing around each tile) and then drawing the smaller line of grout into the seam. Color me crazy, but it was quicker, easier, and notably cleaner. Maybe I was doing it wrong the first time, but I certainly had better success with my improvised method. 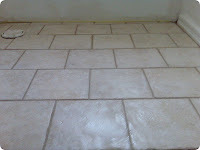 Once I had the gaps filled, I used Garry's grouting sponge to scour away the excess. Quite a mess, too. The rough side of the sponge is for the first couple of passes. 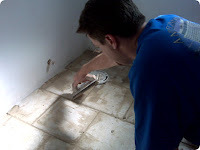 Once the majority of the stray grout is removed, I would switch to the soft side. Then it was a matter of passing over the tile again and again and again, until I stopped picking up anything. About an hour to get it down. About an hour to clean up the extra. Half an hour of prep. Half an hour of clean up. Three hours total. A bit slow, but I am very happy with the results. And, for a change, I think I did as well as any professional. Without the cost of a professional. I'd call it one of my more successful projects. Next up: baseboards, then sealing.